February industrial production dropped a bit, but previous months were revised upwards. 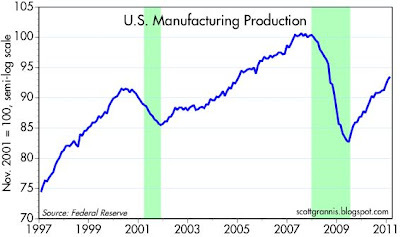 This chart shows a subset of industrial production which strips out things like utilities. Here we see very strong growth—an annualized rise of 6% in the past year. This is strong, and it's significant. The death of American manufacturing has been greatly exaggerated. We still haven't recovered to new highs, but at this pace it won't take long. The problems in Japan are grievous for the Japanese, but they aren't going to derail the US economy.